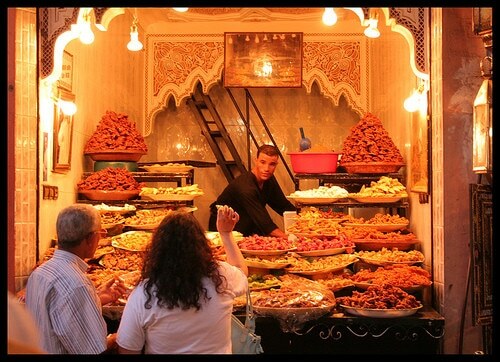 Marrakesh is a bustling and very active city, especially within the walls of its old city or “medina”. A place that’s constantly in overdrive and full of people who, if you’re not careful, will hustle you out of some money. Many of these common Moroccan scams are easily preventable if you’re simply aware of them. You won’t be able to walk very far at all without hearing these three words from mostly teenage and young boys. It’s a game they place amongst themselves – who can get more people lost – and they actually count their triumphs at the end of the day. Basically they want to lead you astray in the medina’s maze-like narrow streets and then will demand money once they help you “find” your way back. You need to be confident and at least act like you know where you’re going, and if in doubt, go the opposite direction of little pointing fingers. You walk up to someone to ask them where to find bread, a map, or cigarettes and you’re lead on a wild goose chase around town. You likely won’t end up with what you were looking for and have to pay for an hour of wandering. If you do need directions or are looking for something specific, ask a shopkeeper, since they can’t leave their shop. The only time to leave a shop without directions is if they tell you to wait for a friend who will show you the way. Don’t get me wrong, bargaining is not a scam and is a part of Moroccan culture. That said, you shouldn’t take the first price you’re quoted. In Morocco, you should typically shoot for 1/4 of the quoted price and work your way to mid ground from there. Bargaining is ultimately about building relationships and you can bargain your way to a good price, even if you don’t know the local language. Don’t try to buy drugs in Marrakesh. You’ll be offered to do so quite a bit as you walk around (particularly if you’re younger) but most claims aren’t legitimate and even if they were, it’s illegal in Morocco. Undercover policemen have been known to dupe tourists into drug purchases only to arrest them – a sticky situation no traveler wants to be in. Typically these scams end with you being asked and intimidated into giving money for the “directions” or “help” you’ve been given. Once you know about these scams they’re easy to avoid; firmly say “no” to anyone who wants to show you around and tell kids that latch on to go away. Violence is rare so you don’t have to be scared in Marrakesh, just aware. It also doesn’t matter how familiar you become with the local kids, they’ll still try and lead you astray day after day, take no mind of it. Scams on tourists are common around the world and your best defense is to know what they are. Even if you do brush up, it’s possible to get cheated so here’s what to do if you get ripped off and 13 other elaborate travel scams to be aware of. Despite these scams however, Morocco is still a place you should visit even if you’re a bit scared to. They’re definitely cute and know how to use their charm. A lot of the little boys would also ask some of the foreign ladies for kisses or even ask them out on dates! Never too early to start working on those skills I suppose, wish I had the courage when I was 5! Definitely. The “let me should you the way” is a common one you’ll find very frequently around the world. Yes – definitely don’t let these scare you away from Morocco! It’s an amazing country! When walking thru the Medina I wish you could leave a little trail of breadcrumbs to get you back! 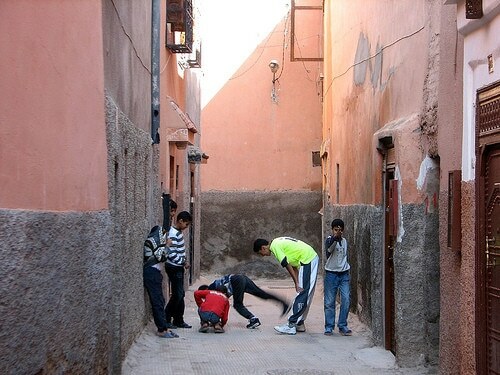 Actually – if not led astray falsely, it can actually be fun to get lost in a Medina – you may find things you never imagined! I would also recommend trying to not go alone – there’s always safety and comfort in numbers! It’s fun once you get a feel for the major paths and markets – it’s not scary at all once you get over the initial overwhelming feeling 🙂 Such a wonderful place and I took your suggestion and had orange juice everyday – how could I not!!?? Great tips Anil, i’ll be in Morocco next week so will certainly take heed. One of the best scams i’ve come across was in Bolivia where pickpockets spit in the air so you’re head/face gets wet and then when you lift your hands to wipe it off they sneak into your pockets and take your wallet/money/passport etc. Amazing the lengths people will go to for the chance of a cheap steal. Like you said, always good to be aware! Eesh, that’s pretty gross – at least the scams in Morocco don’t involve bodily fluids! Don’t listen to the kids and you’ll save yourself a lot of trouble, aside from these kind of con games there aren’t many physically aggressive scams. I loved the tips- but I most especially loved the pics!!!!!! I’ll have some more up soon, it’s harder to get pictures of shops or streets with kids as they’ll ask you money for the photos! 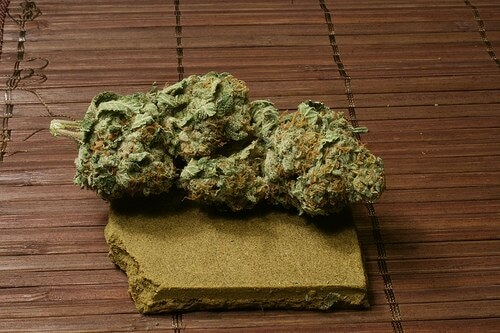 I got hassled a lot for hash while in the old medinas! I never made it up to Tangier, but I’ve been told that it’s especially bad there and in other cities in the Rif (northern) region of Morocco since that’s where hash is produced. Hash is a huge money maker in Morocco (I can’t remember the exact figures but one of the top in terms of tourism) so the government turns a blind eye, I suspect, at production. Still, wouldn’t want to spend any time in a Moroccan jail or be put in a position to bribe a cop to avoid getting locked up. What a wonderful country and city. 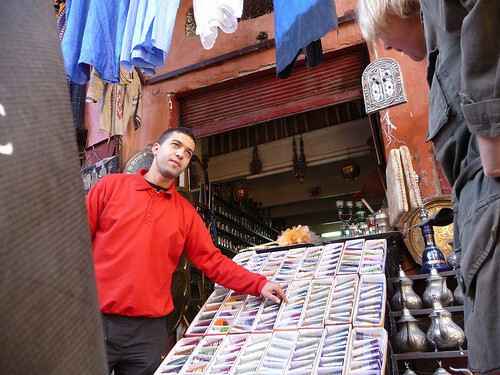 I loved Marrakesh and Fes with their medinas. Being lost is one of the beauties of the place. One piece of advice that I have resorted to a couple of times in my travels is if you are being ripped off or scammed, make a loud noise about it in a public area and move towards a public area and people. If the person is dishonest they won’t want the commotion and typically stop what they are doing. I found bargaining to be a fun activity in Morocco – while I am hardly an expert compared with the Moroccans, I think not being too interested helps a lot in keeping the price down and being aware that the Moroccans are likely to speak your European language when conversing with a friend. They are often very multi-lingual. You’ve got to enjoy the bargaining process and be prepared to set aside time for it, otherwise you don’t end up enjoying it. I too was amazed at how many languages people knew and picked up just from interacting with the tourists. Love the solution to the first scam, walk in the opposite direction they tell you. One issue I’ve always had traveling in foreign countries is how many people approach you trying to “help” you. It’s hard to escape these people, even without acknowledging them. Request for a post: 10 ways to avoid being approached. I’ll add it to the list and be sure to post something about it for you Nico. Haha and I loved how they always give you gifts when you’ve bought something from them, like mirrors and cheap jewelery. Great advice Anil. good to know about starting at 1/4 of the price. We always cut things in half, so we would have ended up paying way too much in Marrakesh. We are trying to plan on where to go next winter, and Middle East and North and West Africa are looking like our top choices at the moment. This may come in handy sooner than later for us. Thanks – start at 1/4 since after you don’t accept the initial offer they’ll ask you “what’s your best price”. If you end up with 1/2 of the original offer it’s usually a good deal for both sides. Ah yes. We got caught in it while on an organised tour of Tangiers! It’s a way of life for them, and sometimes you don’t think it’s worth the haggle but on principle, I agree with a form no. Good advice Anil. 🙂 It can be a fun process when you go along with it. Great Tips. Marrakesh can be pretty hard care with the scams. But it’s a magical city I will always return to. At least the good thing is the scams are pretty blatant once you know about them. I had a blast there too and they didn’t put me off of Morocco at all. I guess when soccer balls are hard to come by you’ve got to keep yourself entertained somehow 🙂 But they don’t have to try too hard, it’s pretty easy to get lost on your own! There’s nothing to be scared of, just aware.